The Breaker Room in the Nintendo 3DS remake. 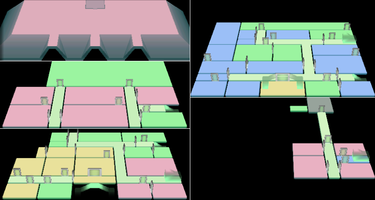 The Breaker Room is a room located in Area Four of Luigi's Mansion. 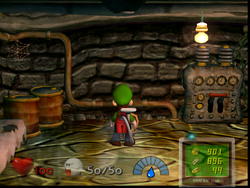 The Breaker Room is accessible when Luigi reaches Area Two of the mansion, but serves no real purpose until after Luigi's battle with Boolossus. After the power outage, Luigi enters the Breaker Room with the key he took from Uncle Grimmly and returns power to the mansion. The Breaker Room is medium sized. There are two oil drums and several barrels in the room. There is also a generator and a cloth-covered table in which a Speedy Spirit hides. The Speedy Spirit must be captured before the Blackout. There is also a mirror opposite the generator, which can only be viewed via the Game Boy Horror. This page was last edited on October 16, 2018, at 21:02.